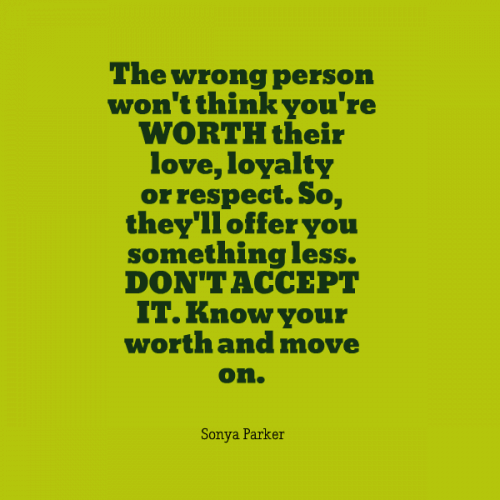 The wrong person won't think you're WORTH their love, loyalty or respect. So, they'll offer you something less. DON'T ACCEPT IT. Know your worth and move on. 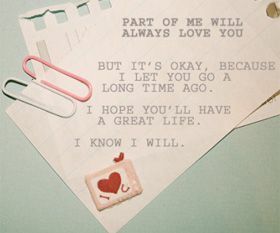 If someone you love breaks your heart, keep moving on. it'll get better, and you'll get stronger. I didn't want to let you go, I didn't want our love to end, I didn't want you to find someone new. Because I knew in my heart would be too hurt to mend. But I did it, I let you go. I let go of all your lies and broken promises, I finally learned how to say goodbye. Don't ask them WHY they hurt you, because all they'll tell you is lies and excuses. Just know they were wrong, and try to move on. What hurts most about love is when you realize that things between the two of you are over. And that no matter what you do to make it go back, you just can't change things anymore. Because he has moved on and you haven't. When someone hurts you time and time again, accept the fact that they dont care about you. Its a tough pill to swallow, but its necessary medicine. 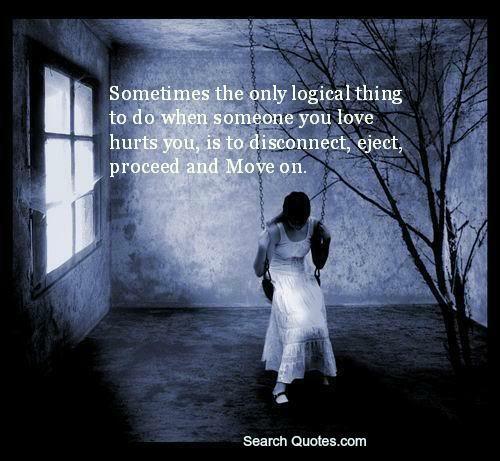 Sometimes the only logical thing to do when someone you love hurts you, is to disconnect, eject, proceed and Move on. Moving on is a nice phrase and a better one, if practiced in real life. Life has to move on irrespective of our good or bad experiences. Moving on helps us to forget the past and place our vision only on our future; this makes life less complicated too. “To be able to move on, one has to learn to forgive not only the person or people who have done one wrong but also one self” are the words of Eugenia tripputi. Only if we develop the trait of forgiving, moving on becomes much easier and gives us a lot of energy to face the hardships. When this is dawned on us, we are in fact moving on to a higher position, and will be respected by others. Quietly forgiving and moving on is a gift to god and yourself. So, be sure to develop this habit and spread this message to others too for the smooth functioning of life.